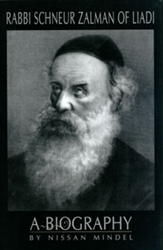 Few luminaries in Jewish history, particularly in modern times, have made as lasting and profound a contribution to our spiritual heritage as Rabbi Schneur Zalman of Liadi (1745-1812). His works embrace the entire spectrum of Jewish thoughtmysticism, philosophy, psychology, ethics, and lawand represent an expression of unparalleled creative genius. This richly detailed biography traces Rabbi Schneur Zalmans life from his childhood and formative years to his trials and triumphs as a leader who revolutionized Jewish life. It reveals many hitherto unknown facts, and offers the reader considerable insight into his extraordinary strength of character. Vilified by many of his contemporaries and persecuted by the Czar, Rabbi Schneur Zalman emerged victorious; today his teachings continue to inspire and vitalize Jewish life all over the world.